It’s time for some HALLOWEEN treats. Of course I’m gonna celebrate with a bunch of spooky cheeses! Have you been possessed by the Halloween spirit, too? Well, good news... I have some tips for making the perfect Halloween cheese board. Start grinding those coffee beans (or grab a bottle of wine) and invite over all your best ghoul friends* for some CHEESE and horror movies! *you can always eat cheese and scary movies alone, and no one will judge you! Tip #1 — Choose an appropriate board. A dark piece of slate is so goth. But, so is a cold slab of marble (like a tomb!). You could also just go with a sturdy piece of wood and just pretend it was once a coffin panel. Some suggestions: Mimolette, Epoisses, Humboldt Fog, Bonne Bouche, Red Hawk, Red Leicester, Bucheron, 1924 Bleu, St. Albans, Taleggio, Midnight Moon, Füürtüfel, Schloss. Tip #3 — Don’t forget the accoutrements! How about some blood-red cherry jam or hibiscus syrup? Chili marconas and chocolate crackers? Caramel apple slices, shards of chocolate bark, and spiced pumpkin seeds? Proscuitto-wrapped bread sticks and a sticky slab of quince paste? Blackberries and dried apricots? Shiny cheese tools like knives and hatches, and bubbling cheese crocks, can also really enhance the mood. Just use your imagination! 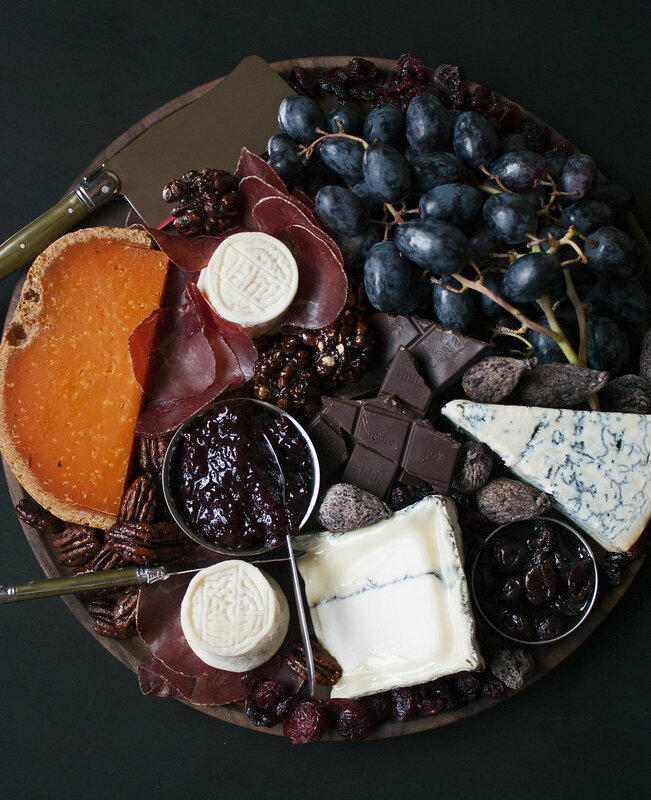 What’s on my dark & whimsical Halloween cheese board?